EXPECT a bonus in your bank account, but don't plan to spend it on a holiday or a new outfit. The Federal Government's cash bonus to support families with the cost of education started going in to people's bank accounts this week. 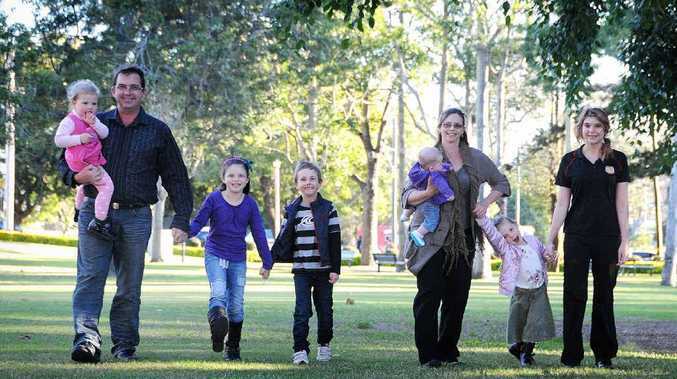 Families, such as Gympie's Devereaux family, who receive Family Tax Benefit Part A will receive a one-off $409 for each child in primary school and $818 for each child in high school. The payment is part of the government's transition from the Education Tax Refund to the new Schoolkids Bonus. It will benefit about 2.2 million kids with expenses like uniforms, books, school excursions, stationery and other costs. This year, eligible families will still be able to claim the Education Tax Refund. Federal Treasurer Wayne Swan and Minister for Families Jenny Macklin said it was about helping busy families. "With the Schoolkids Bonus, parents don't have to keep receipts to claim back expenses at tax time any more. And there's no extra paperwork," they said in a statement. This will be a bonus for parents of six Bruce and Tracey Devereaux, who store receipts "on top of the fridge" find it hard keeping track of all the dockets needed for the tax refund. "It will mean less paperwork," they said. "You buy the uniforms and everything and then you accidentally throw the receipts out. "This will be more streamlined." From January, the new Schoolkids Bonus will be paid twice a year, before school goes back for terms one and three. Eligible families will receive $410 for children in primary school (two instalments of $205), and $820 for children in full-time secondary study (two instalments of $410). The government said 80% of families "weren't claiming what they're entitled to" under the Education Tax Refund. ans one million families will receive more cash - a typical family will get more than $720 extra each year." Save. My wife suggested we save ours for her birthday. Holiday. More Tin Can Bay than Byron Bay. Toys. So these payments arrive the same time as the toy catalogue sales start. Coincidence? Waste. With all the boxes discarded after toy sale, they might need to bring the dump charges in early. Medicine. Painkillers are really expensive these days. Especially as I prefer mine from a stubby. Formula. Two tickets to Gold Coast Indy will do. Petrol. For commuting to and from second job needed to pay for all the price hikes coming our way. Coffee. Needed to keep head clear for late night worrying about how to pay bills.